Justin was an avid student of Greek and Roman philosophy but he found them unsatisfactory. A chance meeting with an aged Christian who explained the Gospels to him made him realize that this was the only sure and useful philosophy. After being baptized, he started a Christian philosophical school in Ephesus. 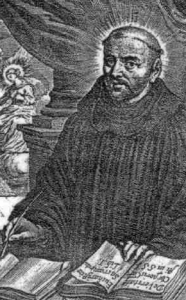 He later relocated his school to Rome and published several books in which he strove to prove that the Christian faith was true. Justin and six of his pupils were arrested on orders of Emperor Marcus Aurelius who was persecuting Christians. They were ordered to offer sacrifice to the Roman gods. Justin replied, “no one in his right mind gives up piety for impiety.” Justin and his students were condemned and were flogged and beheaded. What is the main theme of the first two chapters of the book of Genesis? 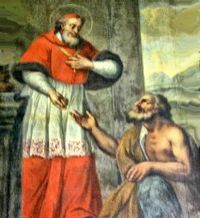 St. Martin was a native of Tuscany and a member of the Roman clergy. He was elected to succeed Pope Theodore in 649. In a Council which he convened, he condemned the leaders of heresy, the Monothelites, and a document from Emperor Constans was censured. The Emperor had him sentenced to death or sent East as a prisoner. He was miraculously saved from the attempt to kill him. The emperor sent others to seize him while he lay sick and was taken to Constantinople. After three months he arrived on the island of Naxos. There he was kept for a year and was subjected to many indignities. He was put in a dungeon in Constantinople and was persecuted. He was abandoned by all as they feared being seized. He died in 655 after a prolonged martyrdom. Following the Eucharistic prayer and before communion. Which comes first in the Lord’s Prayer? Blessing God or petitioning God? Julius was elected pope on February 6, 337 during a time of turmoil which involved the Arian controversy. When Athanasius was returned to the see of Alexandria, Eusebius opposed it and he and his followers elected George. The Arians elected Pistus. Julius convened a synod in Rome and neither group attended. Julius declared that Athanasius was the rightful bishop and reinstated him. Emperors Constans and Constantius declared that Julius’ actions were correct. Julius built several basilicas and churches in Rome. He was pope for a little over fifteen years. He died in Rome on April 12. He was famed for his sanctity. When is the Lord’s Prayer said during the Mass? Born July 26, 1030 at Sezepanow in Cracow, Poland. He was educated in the schools of his native country. He attended the university of Gnesna. For seven years he studied canon law and theology in Paris. He refused the degree of doctor because of his humility and returned home. He was ordained and was given a canonry by the Bishop of Cracow. He was known for his preaching and was sought after as a spiritual advisor. He denounced the King’s cruelties and injustices. Among other things, the King kidnaped the wife of a nobleman. Stanislaus excommunicated King Boleslaaus and stopped services at the cathedral. King Boleslaus killed Stanislaus while he was saying Mass in a chapel on April 11. 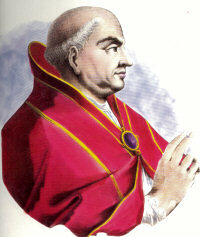 He was canonized by Pope Innocent IV in 1253. Our life in Christ depends on our “hallowing” God’s name. True or False? Being active in the world prevents one from being a prayerful person. True or false? Born in 1751 in France, she exuded exceptional traits of intelligence and devotion early in her life. 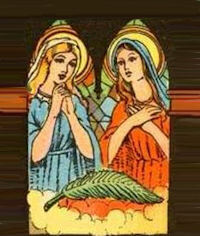 She took a vow of chastity at the age of 14. She worked to support her family who had lost everything. When she witnessed the attempted assassination of her father in 1773, the shock left her partially paralyzed. She fought strenuously against the Reign of Terror from the Jacobins during the French Revolution. She founded the Institute of the Sisters of Notre Dame when calm was restored. Frances Blin, Vicountess of Gezaincourt and Fr. Joseph Varin of the “Fathers of the Faith” assisted her in this quest. At the end of 22 years, at the end of a mission given by Father Enfantin of the Fathers of Faith, she was suddenly cured of paralysis. The purpose was to teach the children of the poor and their salvation. She had to struggle to preserve the distinctively modern character of her Institute. The Institute has spread throughout the world. She died April 8, 1816. Memorized prayers are less effective than spontaneous prayers. True or False? Born at Rheims, France in 1651. After ordination to the priesthood, he devoted himself to the education of boys and founding schools for the poor. He and his companions formed a religious congregation and suffered much because of it. He died at Rouen in 1719. PATRON OF: Educators, teachers, school principals. Where is the primary place of Christian education in prayer?